Available on vinyl for the first time in years, the distinctive singer/songwriter/poet's first Greatest Hits collection from 1975 features 12 signature tracks recorded between 1967-1974, including "Who By Fire," "Sisters Of Mercy," "Suzanne," "Bird On The Wire" and "So Long, Marianne." 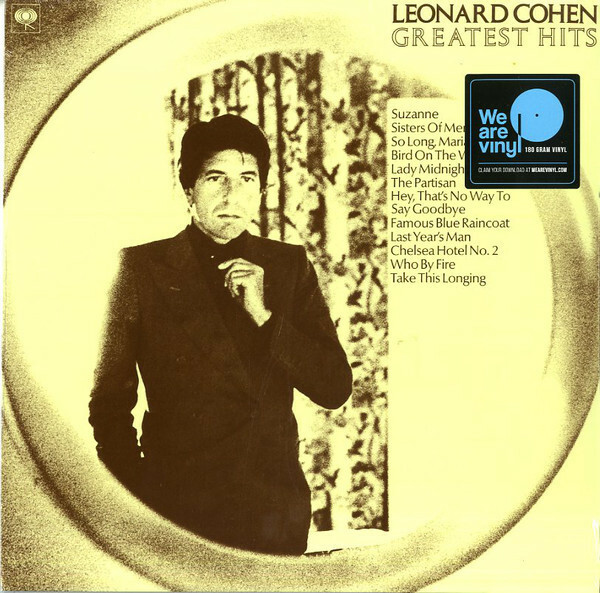 The prolific Leonard Cohen sits outside every category and throws together high culture and street slang, Buddha and the blues, so you never know what's coming next. You'll meet the earnest troubadour, the grave old philosopher, you'll hear the sound of a soul alone raising a cry to the heavens, and that of the silky man of the world. When inducting him into the Rock & Roll Hall of Fame in March 2008, Lou Reed singled out Cohen as among the "highest and most influential echelon of songwriters."